Test preparation courses for your homeschooled student! 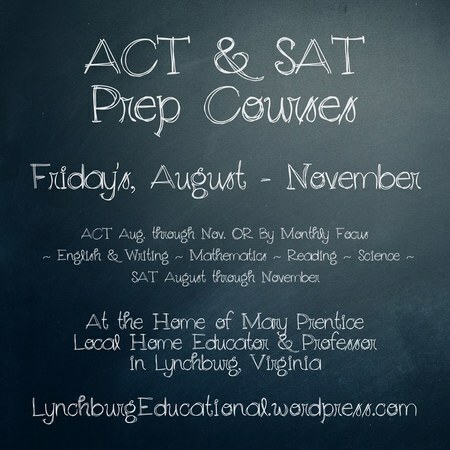 Mary Prentice, local home educator and Liberty University professor, will be offering an ACT Prep Course on Fridays beginning August 2016 at her home in Lynchburg. Students may sign up for either the entire ACT prep over four months OR take monthly-only prep pertaining to certain sections of the test. There are four monthly themes: English and writing, mathematics, reading, and science. The four-month course that begins in August will end by Thanksgiving. Her Fall PSAT/SAT Prep Course will also be offered on Fridays from August through November. The total cost is $85 for 15 weeks of SAT/PSAT prep that is offered in the fall. A summer class that is 8 weeks long during July and August 2016. Each 1 and ½ hour class costs only $8 and so for the entire summer SAT/PSAT test prep the cost is only $64. Yet, students will learn about the new SAT test, as well as math, reading, writing, vocabulary, and general test strategies to help them prepare for the SAT/PSAT test.